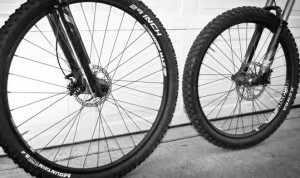 29er (Niner), how much faster? I ride in the woods on the budgetary bike with 26 inch wheels. How much faster one can ride a bike with wheels of 29 inches? Leaving behind-the-scene arguments about why I need (or don’t need) Niner. But I can use calculations to estimate a what advantage can give Niner at a distance “Cross-country marathon in Alpha Bitsa”. To do this it’s necessary to take the actual data of speeds of ride on the existing bike with wheels 26 inches, to transfer it into distribution of pedalling power at a distance, and then provide the reverse conversion to calculate speed of the bike with 29-inch wheels and a slightly higher weight. This is course. 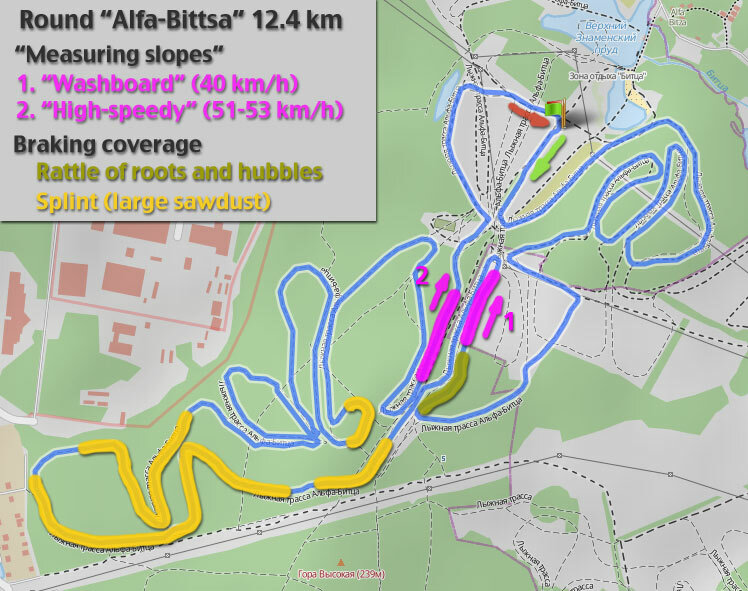 It was described in a separate note “Course for MTB type XCM (marathon) in Alfa-Bitsa (Moscow)“, but I added to it a little more “behind hill loops “and slightly increase trace from the 3rd downhill. It turned out 12.4 km by bike comp (it was 10 km). In any case, link to track. 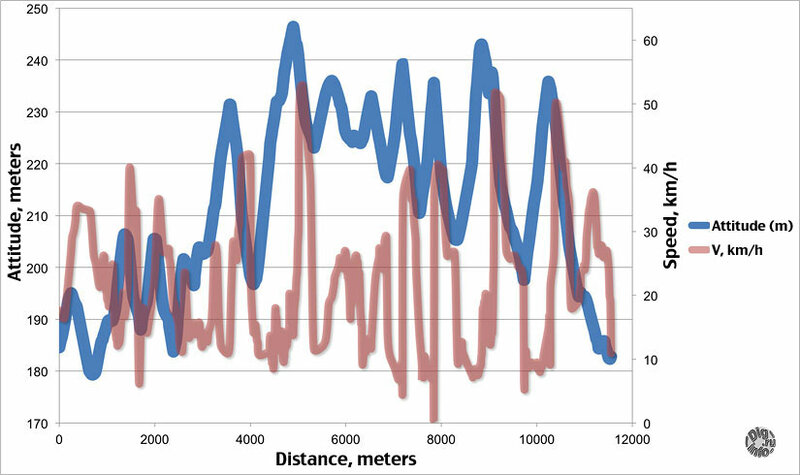 On the track, there are three types of coverage with significantly different resistance to movement. In general this is a common path in the middle of the alley for skating ski in the winter. The path can be a little better or a little worse, smoother or more bumpy, but the wheel rides about the same. Yellow marked areas where swampy glade generously sprinkled with large sawdust. It goes significantly worse. And the green color indicates a rather complex combination of bumps and roots, where you can go only standing because of very shake. Recorded tracks by using Garmin (here a description of the device “Garmin Edge Touring: navigator for cycling“). Right “out of box” track can not be used for calculations. 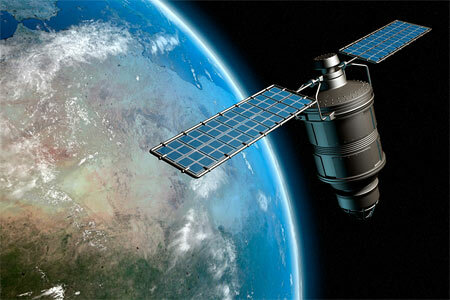 Firstly, GPS accuracy does not allow to operate the attitudes while the calculations of power depend strongly on angles of slopes. Therefore, the track must be passed through the service (I used the on-line service “Garmin Connect”), to replace the height at each point of the track with data from topographic map. Secondly, in the woods GPS works not as good as in the field. Some point are false, it far to side from the track, with the corresponding large jumps in measured speed. On the whole, the track length is measured less than it actually is because of cutting a small loops, but this would have to be ignored. Therefore, the track had to be “combed” by hands in Excel, throwing out pints with large jumps of velocity. In any case, the translation GPX file with the corrected heights to a text file made with on-line service: “GPS Visualizer”, then this text file, consisting of rows, “the two coordinates and time” was imported into Excel. Further, based on these data one need to calculate spent power by formulas which were explained in note: “How cycling power spent during moving a bike“. To do this, from adjusted GPX-file was taken speeds and angles of ascent/descent. Weight “loaded rider + bike” is easy to measure. Coeff. aerodynamic drag (Cx * S) was taken as 0.5 sq.m. Unknown remain coeff. rolling resistance on the above three types of coverage. Coeff. on the main part of track (80% of total length) can be determined by “measuring slopes”. Pull from gravity that is known with high accuracy from the weight and the inclination angle is balanced by aerodynamic and friction. Calculations gives coeff. rolling resistance = 0.025. Incidentally, this is three times more than has been determined for the road bike on a smooth coating in the following note: “Finding parameters of rolling of bicycle from measurements of power of pedalling“. Seems legit. Average power on the main areas was found to be 206 watts. The same seems to be true. The application of such power to the parts with a splint and roots give the appropriate coeff. rolling resistance of 0.045 and 0.075. Thus, there is a distribution on the length of the route of all required parameters, as well as calculation of consumed power. Now the most interesting part. It is necessary to define the difference between a hypothetical Niner from my budgetary bike. And Niner should be the same “budgetary”. That is as it should be put wheels 29 inches into the existing bike and slightly stretch the frame. The weight of the wheels increased by 350 grams, the weight of the frame and fork by 250 grams. 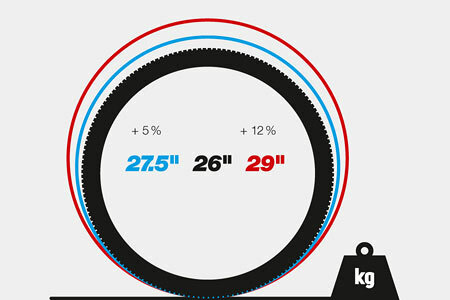 Total weight gain of Niner bike compared to 26 inches one can consider equal to 0.6 kg. The ratio of the radii of the wheels (including the thickness of the tires and the tire sag 20%) is 0.91 (note that 26/29 = 0.90 inch because wheels in the names is “about”). Since the dimensionless coeff. 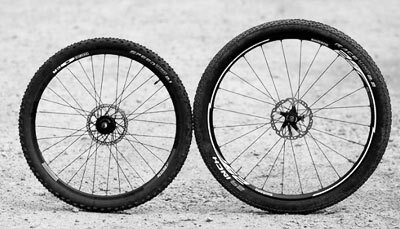 rolling resistance contain factor 1/R (R – the radius of the wheel), the Niner is different from the bike 26″ by two parameters: all defined on the track coefficients of rolling resistance multiplied by 0.91, and the weight (bike + cyclist) increased by 0.6 kg. Unfortunately, this is all that we can take “not from the ceiling.” In fact, this dependence of coeff. rolling resistance of the radius is suitable only for “rough” coatings, such as wood chips, where the size of elements that resist to wheel rolling substantially less than the thickness of the tire. In the forest a lot of bumps and roots that Niner will take much easier, as it will be able to “swallow” the obstacle without such a strong rebound as the wheel 26″. Hypothetically, you can draw on paper step on which the wheel “26” stop (corresponding coeff. rolling resistance = infinity), and the wheel “29” will pass (coeff. rolling resistance is confined). In addition, the wheel of Niner will be pumped to less pressure (see. Calculator Tire pressure (MTB bike) ), so this wheel will better “swallow”and small obstacles too. But put these arguments to digits I can not, so one can rely only on the reduction of coeff. rolling resistance for Niner to 0.91. But consider this as an upper bound. Real coeff. should be smaller. For each segment, using the corrected data on friction and weight was made a reverse conversion to the velocity of the Niner on the segment. Solving the inverse task involves the solution of the cubic equation, which may have three roots. So sometimes the calculated “drop down” of speed was too much different from the original. These segments were “ruthlessly” thrown away. It turned out that on Niner I would rode the track still faster, but not much, just 3.5%. This is the time from total 40 minutes approximately 1.5 minutes. When estimate originally segments, I thought it will be 6% and believed that it would be really noticeable. One and half minutes on the round is smaller than the real dependance on how dry the track, on the physical state, etc.